The new version of Stephen King's "It" isn't a great movie, but it's a great audience movie. And it has been made with a big screen in mind. The moments of suspense and shock have been timed (by editor Jason Ballantine) to make the audience giddy with anticipation, then flood the screen with bursts of audiovisual noise to camouflage any yelps or screams, then ramp down to relative quiet so that viewers can laugh about how scary a moment was or lie about not having been scared at all. King has such a direct connection to the collective unconscious that his stories tend to grip you regardless of their literary merit, and at his best, he offers plenty in the latter department. He's the Charles Dickens of horror, depicting the dynamics of friendship and community with as much facility as he brings to the creepy or gory parts of his work. 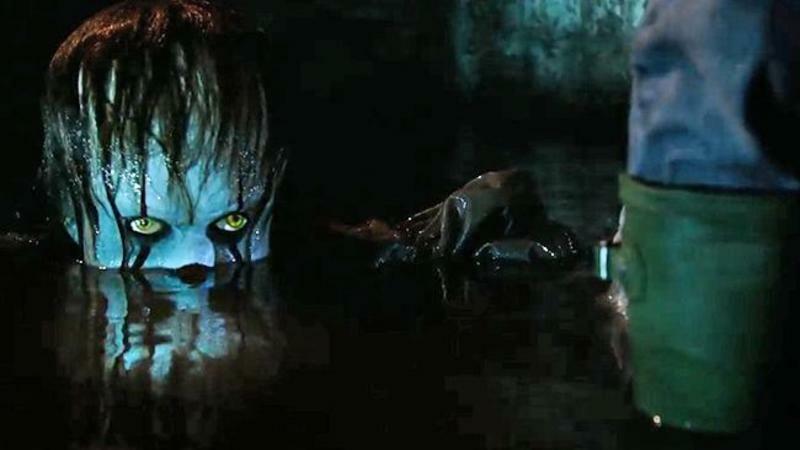 "It," about a group of intrepid friends trying to rid Derry, Maine of an evil demon that lives in the sewer, thrives on fear, and often assumes the shape of a razor-toothed, shape-shifting clown, is one of his masterpieces, up there with "Carrie," "The Shining," "Pet Semetary" and the various novellas that comprise "Different Seasons" (all but one of which have been turned into movies). It also has an innate emotional pull, in the same vein as "Stand by Me," aka "The Body," another King tale of social misfits embarking on a mythic quest to confront death, literally in the case of "Stand by Me"—the kids were trying to find the corpse of a young boy who'd gone missing—and mythologically in the case of "It," a novel built around a Grim Reaper figure who emerges from a Stygian underworld to scare, kidnap, maim, or kill mortals. As storytelling, this new version is just OK—far superior in production value to the 1990 TV miniseries, which suffered from content restrictions and a limited budget, but less subtle in its characterizations. Its treatment of Pennywise the demon clown is different, knowingly so. Where Tim Curry played Pennywise as a bona fide character, a being that seemed truly evil yet also somehow as tangible as Jack Nicholson's homicidal writer in "The Shining," this incarnation played by Bill Skarsgård (son of the great character actor Stellan Skarsgård) is more of an '80s horror movie spook in a Freddy Krueger mold. More so than in the miniseries, you have to give up hope of ascertaining which rules, if any, govern Pennywise's appearances. Sometimes doors shut him out, sometimes he just appears in the room as needed; sometimes he seems clever, other times dumb; sometimes he seems nigh-invincible, other times you can do serious damage with a spear, a bat, etc. He's whatever the movie needs him to be at that particular moment, and you just have to roll with it, bearing in mind the creature's admonition that it's everything you've ever been afraid of. Not for nothing is the title "A Nightmare on Elm Street V" glimpsed on a theater marquee near the end; it's the film's way of fessing up to what it's doing. Skaarsgard's interpretation is chilling on its own terms, though, with many imaginative touches, such as lowering his face to make his dome more prominent, conjuring memories of the way Stanley Kubrick used to film humans who've become animal-like or monstrous, and making his growl quaver and crack when he's taunting the kids, echoing the pubescent creakiness of the young male actors' voices. The sense of the creature's being intimately connected to the history of Derry doesn't come through as strongly as it might, though. That tends to sever the main characters from their town, minimizing the sense that an entire community has a stake in the outcome of the tale and turning it into a small-scaled, personal story about individuals conquering their demons by conquering an actual demon. The film treads lightly over Pennywise's role in a racially motivated incident of arson in Derry's past—the burning of The Black Spot, a club frequented by black soldiers, by The Maine Legion of White Decency—and the gang of white bullies that regularly terrorizes our heroes never uses any slurs when harassing the lone black member of the Loser's Club (Mike Hanlon, played by Chosen Jacobs), leaving racial animosity more implied than stated. The movie also fails to connect particular horrific visions to the characters that inspired them in ways that would might them pop, as the greatest setpieces in the King filmography do (the only girl in the group, Sophia Lillis' Bev Marsh, gets drowned in blood a la "The Shining" elevator soon after buying tampons, a vision worthy of Brian De Palma's original "Carrie," but there's little sense of the two moments being symbolically connected, a conspicuous failure for a horror film of this type). At two hours and fifteen minutes, the movie also starts to develop a monotonous rhythm, serving up regular jolts at the ends of scenes where characters have a freaky/mysterious experience, almost always ending with Pennywise getting up in their faces or chasing them out of the room, his body shimmying and spazzing like a ghost in a Japanese horror movie. All that having been said, this film still works like gangbusters if you're in a receptive frame of mind. Like the Netflix series "Stranger Things," which raids the collected works of Stephen King as well as Steven Spielberg and John Carpenter, this "It" is an eighties nostalgia trip, set in 1988 and '89, stocked with vintage cars and clothes, and often scored with radio deep cuts from the period; but like that series, it makes sure to put characterization and emotion front-and-center, focusing the story on underdogs who've all experienced trauma, some worse than others. Aficionados may already know that this movie has been in the works for a long time. It nearly came to fruition via "True Detective" director Cary Fukunaga and his cowriter Chase Palmer, who subsequently left the project and were replaced by director Andres Muschietti ("Mama") and screenwriter Gary Dauberman ("Annabelle"). A sequel, set 27 years after the events of this movie and dealing with the "present day" scenes in King's novel, has already been green-lit and might arrive onscreen in the next couple of years. The book is a monster in every sense, a doorstop that runs 1,200 pages in most editions, so this is one of those rare cases where splitting the story up into more than one film seems like a natural response to the needs of the material and not just a cynical attempt to pad things for commercial reasons. Muschietti's "Mama" felt more personal and strange, and not even the most vivid images in this movie can touch the best of what he had to offer his last time out (some images from "Mama," such as the top of the ghost's head seeming to "swim" through shag carpeting as it chased a mortal, haunt me still). But this is still a sharp job of direction, often more measured and intelligent than it needed to be to get the point across. I especially appreciated the way Muschietti lets Skaargard drive certain scary moments by twisting or walking strangely, as a stage performer might, saving body-altering CGI for surreal or disgusting shock effects. I write this having seen "It" in a sold-out screening at the Alpine Theater in Bay Ridge, Brooklyn, on a Saturday night, on opening weekend, in the company of my son and his best friend, both 13. As is so often the case with horror movies, opening weekend proved to be the optimum time to go to this kind of film. Horror, perhaps more so than any other genre, thrives on the communal experience. The audience is jacked up on adrenaline (or something else). Their investment in the movie becomes part of the show, and as long as the merger happens organically, as a result of whatever the film is doing to them from moment to moment, the result can be a sublimely raucous night out. This is one of the better communal experiences I've had at a genre picture recently, up there with "Get Out," "Hell or High Water" and "Don't Breathe." In terms of sheer craft (writing, direction, cinematography) it's not on the level of those other films—although, as I mentioned up top, the cutting is exceptional, giving the audience jolts of varying magnitude, like a cattle prod that can be dialed down to deliver a subtle buzz or dialed up to make you jump right out of your seat. I expect this version of "It" to be a huge success. During the first 15 minutes, a teenager sitting behind me commented to his friend, "The volume is louder than last night."